Speech bubbles are reminiscent of classic comic books. Use these free printable scrapbook patterns to add speech bubbles and fun to your scrapbook pages. You can use the bubbles for journaling, quotes, or sayings on scrapbook page layouts based on any theme. 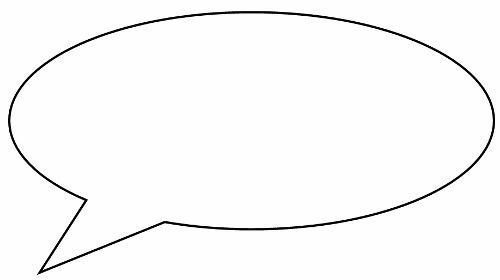 This is a classic speech bubble with clean, sharp lines. To save this pattern to your computer, simply right-click the full-size image and select "save as." To resize and print the pattern, you can right-click and select "copy." Open a word processing document and right click on the document and select "paste." Then, click anywhere on the image to select it and then click and drag one corner to resize it. This rounded square pattern works well with more text. To save this pattern to your computer, simply right-click the full-size image and select "save as." A square "bubble" can hold a large text block ​and gives a contemporary look to your scrapbook page. To save this pattern to your computer, simply right-click the full-size image and select "save as." Printable pattern 4 is a thought bubble. Keep your scrapbook page fun with this contemplative bubble to accent a photo. To save this pattern to your computer, simply right-click the full-size image and select "save as." This pattern includes a fun arrow, which is a great visual indicator for drawing the spectator's eyes to just the right point of the scrapbook page. To save this pattern to your computer, simply right-click the full-size image and select "save as." This design would be great on a superhero-themed scrapbook page. Can't you imagine it saying "Ka-pow!"? To save this pattern, simply right-click the full-size image and select "save as."